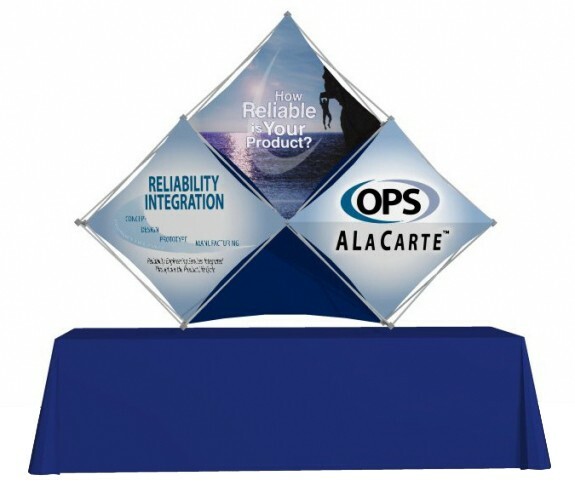 Easily create an eye-catching desktop display with the diamond pop up. The display features an aluminum sturdy frame that easily snaps up in 1 step and collapses to a compact size in 1 step. Each diamond cavity can hold 1 custom printed PVC or stretch fabric panel that hooks onto the pop up frame using metal grommets. The PVC or stretch fabric panels can be interchanged, mix and match, and can have different sizes to stretch across several diamond cavities. This particular diamond pop up includes 3 separate PVC or fabric panels—1 for each cavity in the frame. The entire display measures 6.5’x5’ft and folds down into a compact and portable size to fit into the included canvas carrying case. Extra custom printed PVC or fabric panels also available--priced per square foot (posters & banners category).